Seventy-two percent of the owners turned out in this year's election and budget vote. This is the ninth consecutive vote above 64% participation and the third time reaching 72%. By comparison, voter turnout was 54% for the 2016 presidential election and is 10% -20% for most HOA's using "in person" voting. 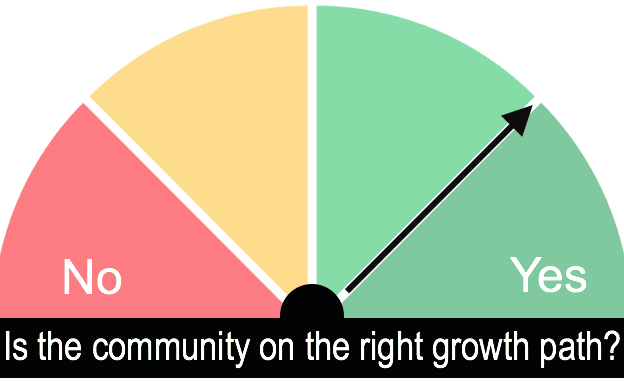 Is the Community on the Right Path Overall, the community scored a "2" on a scale of 1-5. Only five owners voted in the "not so much" or "no" categories. Assessments: $272 a quarter, comprised of $266 to cover mandatory expenses and reserves and a one year bump of $6.00 to cover the costs for the installation of a new mail station. 29% of voters abstained, rather than approve, the mandatory expenses. Directors: Robert Bauer (re-elected), Joel Kern (first term), Jesse Mitchell (first term), Randy Ranew (re-elected), David Schneider (serving second year of two year term). The directors will meet and elect who will serve as officers. Mail station: 43% voted for new mailboxes at the garage (the majority preferring the automated door option), 31% for new mailboxes at the current location, and 26% voted to do nothing or just replace the one ugly box put in place by the Post Office which is old and doesn't match the rest. Exit gate: The initiative from the annual meeting to install an automated exit gate lost with 58% voting against and 42% in favor. Amendment 1: No Street Parking was approved with a 78% majority. Amendment 2: Violation Fines was approved with a 67% majority. Infrastructure: Repair Garage Foundation - approved with a 85% majority. Infrastructure: Repair Parameter Fence - - approved with a 93% majority. Bookkeeper Performance: 47% had no opinion. Of those with an opinion, 89% were favorable of Guardian Management.